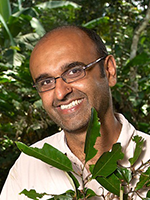 As Professor of Ecosystem Science at the School of Geography and the Environment and Programme Leader in Ecosystems at the Environmental Change Institute, Prof. Malhi's research interests focus on interactions between forest ecosystems and the global atmosphere, with a particular focus on their role in global carbon, energy and water cycles, and in understanding how the ecology of natural ecosystems may be shifting in response to global atmospheric change. More recently his interests have expanded to include the impacts and limitation of tropical deforestation. Prof. Malhi received his first degree in physics from Queens' College, University of Cambridge, and a PhD in Meteorology from the University of Reading. His early post-doctoral work at the University of Edinburgh focused on measuring ecosystem carbon fluxes from pristine Amazonian rainforests, and this led to a deeper interest in the ecology and dynamics of tropical rainforests. In 2000 he co-founded the Amazon rainforest forest inventory network (RAINFOR) which has been revealing fundamental new insights into the biogeography of Amazonian forests, and how they are responding to global atmospheric change. He was a Royal Society University Research Fellow at Edinburgh University between 1999 and 2004. In 2005 he was appointed a University Lecturer at the School of Geography and the Environment, in 2006 he became Reader in Terrestrial Ecology, and in 2007 Professor of Ecosystem Science. He leads an active Ecosystem Dynamics research lab focussing on forest vegetation-atmosphere interactions, employing field studies, satellite remote sensing and ecosystem modelling. He also manages the Ecosystems Programme of the Environmental Change Institute, Oxford. Prof. Malhi is an Honorary Fellow of Edinburgh University and UCLA and a Visiting Fellow of Leeds University. He is also a member of various committees including: the Royal Society Advisory Committee on Climate Change and Ocean Acidification; the Royal Society Committee on Science in Society; and the Scientific Steering Committee of the Large Scale Biosphere Atmosphere Experiment in Amazonia. He has delivered invited seminars/plenaries in numerous universities, including Harvard, UCLA, Berkeley, Duke, Cambridge, and Brasilia. He was the editor of a thematic issue of Philosophical Transactions of the Royal Society, B, and has been a contributing author to the Intergovernmental Panel on Climate Change, Working Group 1 and the organiser of major multidisciplinary international conference: Climate Change and the Fate of the Amazon in 2007. The major focus of his work is understanding the interactions between forest ecosystems and the atmosphere. This includes the cycling of carbon, water and nutrients, the climatic controls on ecosystem metabolism and biomass, and more recently, assessing the impacts of land use change and the potential of forest protection to mitigate global climate change. His research techniques combine the diverse disciplines of ecological and forest field surveys, ecophysiological measurements, micrometeorological field techniques, satellite remote sensing, vegetation-atmosphere modelling, and social science. He has a particular interest in tropical forests ranging from Malaysia to the Congo and Zambia, but especially in Amazonia and the Andes. Since 2006 he has been engaging in a major study looking at an elevation transect in the Amazon-Andes, ranging from 200m to 3600m in elevation, and has ongoing research interests across the lowland forests of Amazonia through the RAINFOR project. More recently he has embarked on an expanding programme of research looking at the functioning and climatic response of temperate woodlands of the Upper Thames. Prof. Malhi teaches on biodiversity and ecosystem assessment techniques for the MSc in Biodiversity Conservation and Management. He also teaches on tropical forests, environmental modelling and GIS/remote sensing for the MSc in Environmental Change and Management, for which he is also an internal examiner. Many of these papers are available for download from Prof. Malhi's personal website.